A museum is a collection of collections. Some museums are encyclopaedic in their collections whereas others are more focused on certain types of collections. But single collections do not make museums, except that sometimes the naming of these institutions does get confusing. Some galleries and institutions have collections and others don’t, some places call themselves museums and others don’t. Single collections do not make museums because the collector limits the collection in that you can to clearly see the identity of the collector in the collection. A collection of anything is similar to a work of art; it could be a work of art, consider Duchamp’s readymades and Danh Vo’s 2012 Hugo Boss Prize winning exhibition of the collection of Martin Wong. I saw Danh Vo’s exhibition at the Guggenheim in 2013 and it was a portrait of Martin Wong readymade from the things he collected. Perhaps this is one of my problems with David Walsh’s MONA in Hobart, it is not a museum it is just his art collection (see my post on MONA). There are limitations on the number, quality and taste that a single collector can bring to a collection. A collection of collections fills in gaps in the have occurred in a single collection. In this respect an art museums collection may taste blander than that of a single collector that preserves the original taste of eccentricity. You don’t have to be a multi-millionaire to be an art collector but it does help, a lot. There are collectors with important collections who aren’t rich (see my post on London Regionalism). But the collectors who open their collections and homes, or palaces in the case of Isabella Stewart Gardner, to the public are the very rich. The Isabella Stewart Gardener Museum in Boston is an astonishing collection. It is well worth a visit even though but much of the collection is not of highest quality. I had a lot of fun at the Isabella Stewart Gardener Museum. I played at seeing how many works I could identify and put a date to and then check the room sheets to see how close I got to the correct answer. It is also a very eccentric collection, right down to the admission fee: free to people named Isabella or people on their birthday, a $2 discount to people wearing Boston Red Sox items and to people who have visited the Museum of Fine Arts in the last three days (I qualified for the last one). Isabella Gardener was a dedicated collector but that was not her main love; that was art, music and literature. Collecting was simply a means to an end and it was not the only means. Gardener provided work-space, accommodation and even travelling expenses for artists, including John Singer Sargent. The Frick Collection in New York has the same variation in quality and taste that can be seen in Isabella Stewart Gardener’s collection. It is a super collection with some of the best paintings that I’ve seen. However, the wall paintings of the absurd cherubs in the “Boucher Room” may not to be contemporary taste. Actually the Frick Collection is more a museum than the Gardener Museum as the Frick Collection has been added to considerably since the death of Henry Clay Frick. London, Ontario is the first place that I remember and I lived there for 7 years during the first 9 years of my life. London is on the River Thames in Middlesex County in Ontario; it is a very Anglo area of Canada. It is a small university city and this was part of an environment that allowed for people to develop in freedom. At the time my father was lecturing in Zoology at Western University and London it was going through its own artistic renaissance. And this is the point of this blog entry how a small city became significant in the history of Canadian art. Recently I returned to London for the first time since I left. I was fortunate to see “A Circle of Friends – the Doreen Curry Collection” at the Western University’s McIntosh Gallery. This modest collection by a librarian from the local public library shows that you don’t have to be a millionaire to put together a significant art collection. For Doreen Curry only collected work from local artists who she knew and these artists turned out to be significant to Canadian art of the 1960s – 80s in a movement called London Regionalism. The focus of Regionalism wasn’t a particular style but the local site and building a community mindset that embraced complete artistic freedom. When I visited the National Gallery of Canada in Ottawa I was surprised to find that the Regionalists of London Ontario are so important to Canadian art history. The first room of the Canadian art section, “Modern 1960 – 1975” is full of their work. Then at an exhibition on abstraction at the Musée d’Art Contemporain de Montréal I saw more paintings by Paterson Ewen. The local artists that Doreen Curry collected included the twin artists, David and Royden Rabinovitch. David Rabinovitch was studying at the University of Western Ontario when he did his first floor sculpture. Greg Curnoe, painter and drummer, kazoo-ist and co-founded of the Canadian noise band the Nihilist Spasm Band. Curnoe also published a Region magazine and established an artist run centre in 1973. And Murray Favro, an artist and the guitarist in the Nihilist Spasm Band. Along with Ron Benner, David Boldoc, Richard Bonderenko, kerry ferris, Dave Gordon, Jamelie Hassan. Doreen Inglis, Ron Martin and Paddy Gunn O’Brien. There wasn’t an overall style to the art of the London Regionalists just a location and enjoyment of artistic freedom in materials and expression. The location with both the Western University and the public library was important to that local regional cultural renaissance. I would like to say that some of this radical art attitude rubbed off on my young self that the Regionalists had indeed succeeded in building a mindset that embraced artistic freedom in me. I remember the public library’s collection other media and I listened to a lot of the spoken word from its the record collection. The library’s director Dr Crouch was very progressive and believed that information could be contained in media other than books. I also remember visiting Western University on an open day and going into the art workshop and an artist saying: “We don’t use art materials any more, we use anything” and pointing to an assemblage of monkey wrenches on the wall. Maybe it was David Rabinovitch or one of the other Regionalists. I have some vague memories of visiting the public art gallery with my mother and siblings as it was in the same building as the public library. And I definitely remember enjoying an exhibition of edible art by some university students, as you could eat the art after the viewing time. It was an interactive exhibition, in the elevator on the way to the exhibition one of the students announced that he had brought his own spoon. It wasn’t the most serious of exhibitions, these weren’t exclusively art students, and some of the works were just a bunch of students having a laugh, like the rice crispy coffin or the mock up of the cake from the cover of the Rolling Stones “Let It Bleed” (released Dec 1969). Other pieces had a message; the aquarium full of what appeared to be polluted water with weeds and a coke can was in fact a jelly. Anyway I was digressing into reminiscences when I should be looking at what made London so fruitful artistically. And even this question is around the wrong way, although the public library, the university and the city were part of the structure that allowed the London Regionalists it was the artists who made it, who were determined and conscious about their goal to make it artistically free and fruitful. Sunday was a big day in Melbourne’s street art calendar and yet there was no aerosol in the air – it had been replaced by the smell of money. I’ve been following in blog posts the progress of street art moving from the street, into the gallery and now into the auction house. Not that this is the first street art auction in Melbourne but the Andy Mac Collection is an important event and Leonard Joel is a major art auction house. For over a decade Andy Mac (aka Amac) has been involvement with Melbourne’s street art. 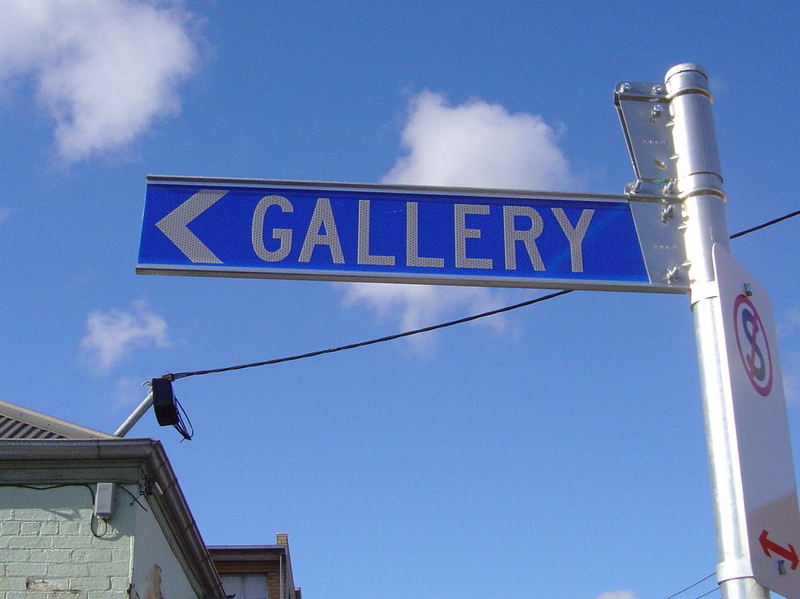 He established City Lights (in Centre Place 1996 and in Hosier Lane in 1998) and then Until Never gallery in 2005. He is the first person for a media or documentary interview on Melbourne’s street art. 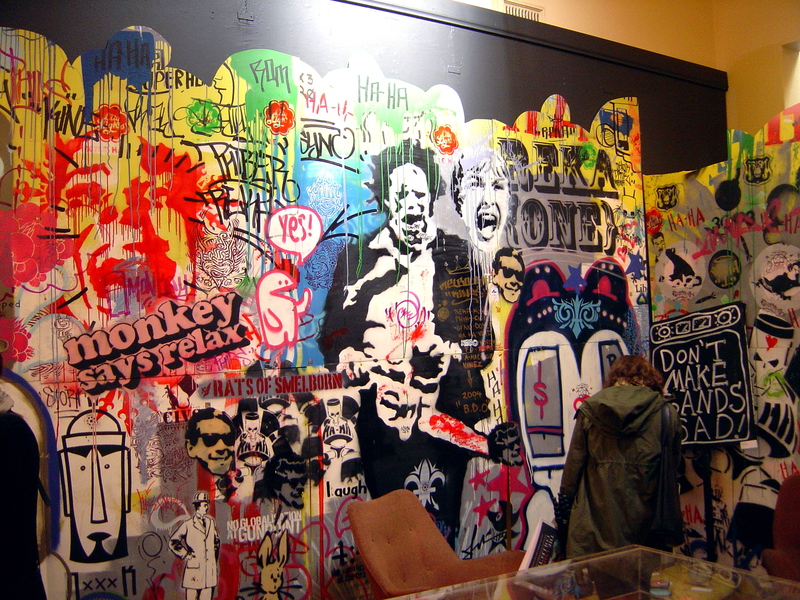 He has also been a serious collector, not just of street art but also skateboards, ceramics and rock band posters for a quarter of a century. The auction is a serious operation with a full colour newsprint catalogue, receptionists, and a floor talk by Andy Mac on the Saturday before the auction. Viewing of the Andy Mac Collection – “street and fine art from Citylights Project 1992-2012” had been open all week at Leonard Joel auction house in South Yarra. And the publicity for the auction had been going since March (my father sent me a clipping from The Australian 3/4/12 about the auction – that’s what people did before the advent of the online world). There is a lot of money at stake in this auction, an expected $350,000. Andy Mac will get his superannuation retirement investment. And Leonard Joel will get the 22% buyers premium along with a percentage of the auction price. And some artists may have a game changing moment in their career. 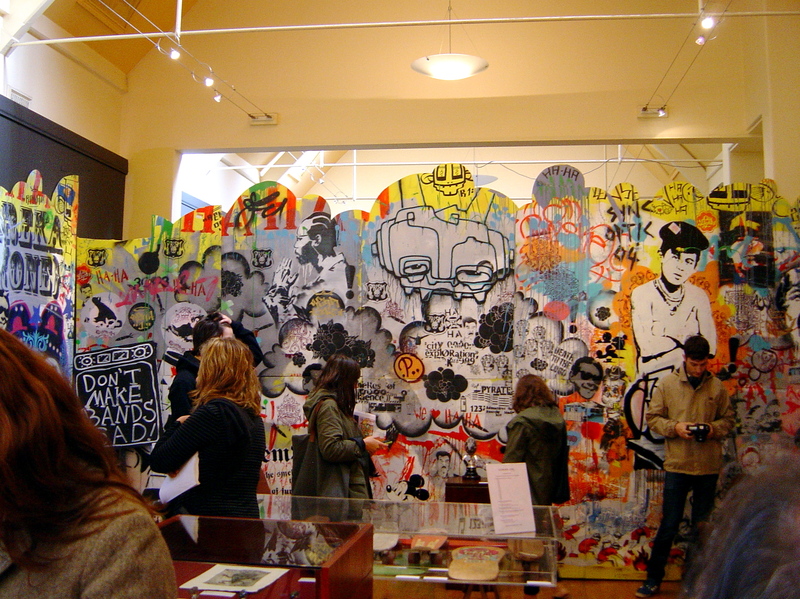 The viewing room was a major exhibition of street art itself, complete with catalogue. 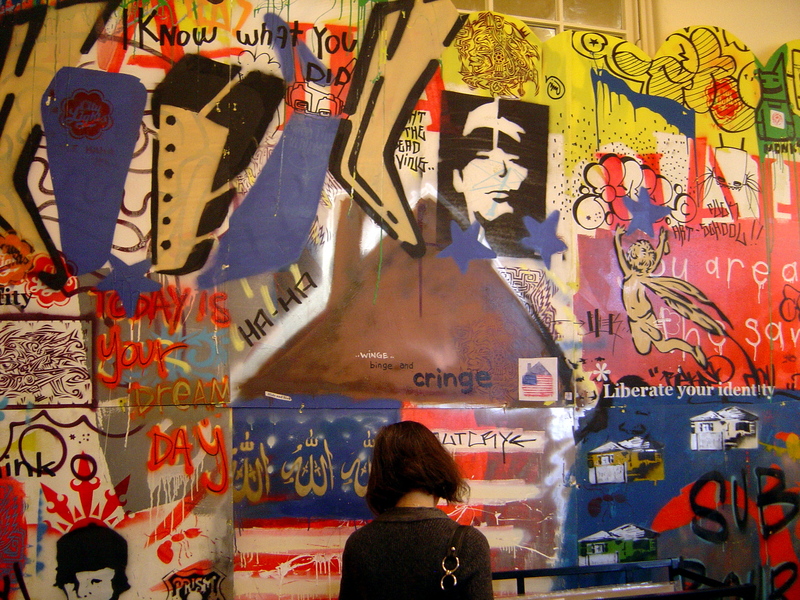 Three walls at one end of Leonard Joel’s converted old schoolrooms were covered in wall panels of stencils from 2004, the Freeze Muthastika. This collaborative work was painted at the Big Day Out in 2004 and consists of 72 panels (measuring over 30 metres in length, or 60 sq metres approx). Two sets of these panels were sold for $28,000 and the other two were passed in passed in. On Sunday the auction room was packed; they even had to bring out more chairs to put another row down the back although numbers thinned after an hour. Along one side of the room there was a table of telephones and laptops attended by assistants dealt with the phone and online bidding. Lots were displayed digitally on two screens and there were over 500 lots to get through (so I did not stay to report on all the details). Art collector Andrew King started the bidding on the first lot up for auction and over the course of auction added many works to his extensive street art collection. (For more about Andrew King and Sandra Powell’s collection see CDH’s interview with them on Invurt). King was not alone in the bidding and there was sometimes stiff competition for particular works. J.D. 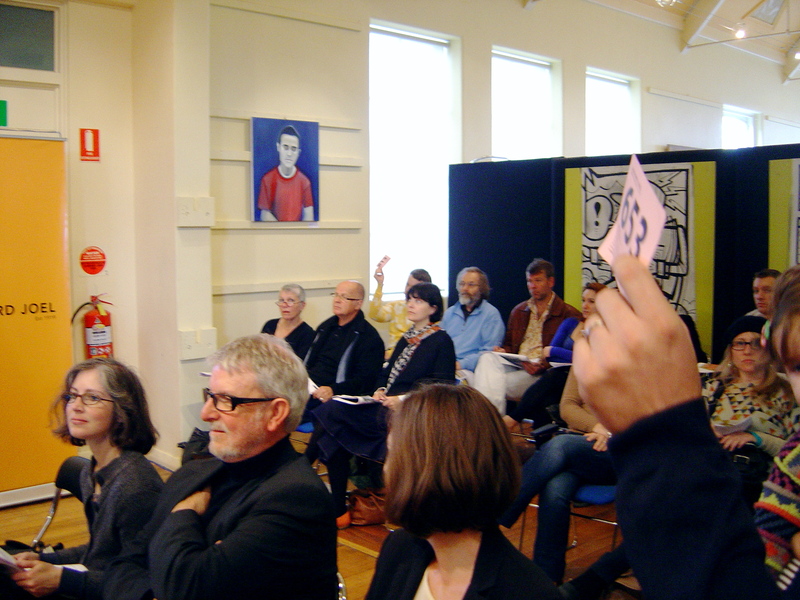 Mittman, the former gallery director of Famous When Dead was also bidding, seated at the back of the room with the artist, Adi. There weren’t many artists in attendance; Adi, Miso and Seldom were the only artists that I recognized. The auction house estimates were on the optimistic side and it was rare for a lot to go above that price. A few lots went unsold, most of those due to the bidding falling just shy of the reserve price. Some lots achieved different prices depending on the colour of paint sprayed through same stencil by an unknown artist: 84. brown (unsold), 85. red (unsold), 86. purple (sold $200) 87. black (sold $260). 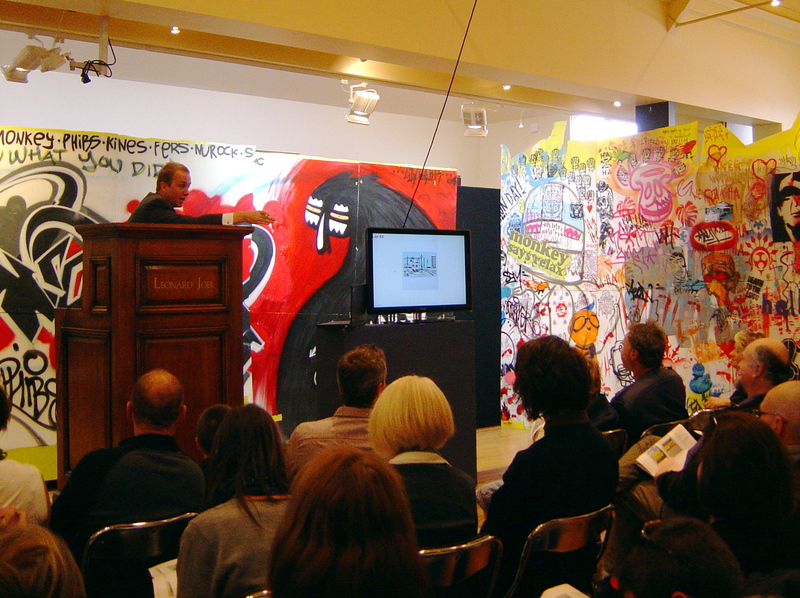 Other lots achieved different prices depending on the subject of the art. You can see the auction results for yourself at Leonard Joel’s website (all prices quoted exclude the 22% buyers premium).